As you have no doubt noticed (ha!) I have been spending a lot of time researching WW1 soldiers recently - well, oddly, delving into one of 'my men' has sent me down a more traditional family history research path over the last week and given me a better understanding of one of Barnsley's old families and institutions, Guests of Market Hill. The building that is (last time I looked) a pub called Durty O'Dwyers used to be a grocer's shop called Guests. According to ML, one of the ladies who volunteers with the Barnsley War Memorials Project, "Guests Confectionery was THE shop to patronise if you were well off. Ladies with big hats, long gloves and their pearls used to visit for afternoon tea, this was in the 50's. Sometimes as a treat, [we] used to go in our walking out days." 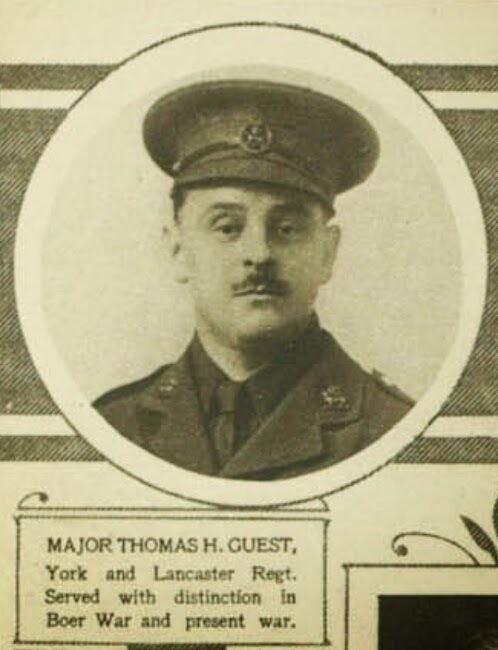 This is Major Thomas H Guest who was remembered on St John's Memorial Tablet in the church in the Barebones area of Barnsley, sadly lost when the church was demolished in the 1960s. This memorial is one I am especially researching as many of the OH's family came from that area. I found his picture in the Illustrated London News on a special website they have set up to commemorate the First World War - you can search the ILN and eight other magazines from the same company for the years 1914-1919 completely free of charge. There are lots of pictures and contemporary articles about the war and some very amusing old adverts! He is a bit of a mystery man, his Commonwealth War Graves entry and reports in the Barnsley Chronicle give very few clues about where he was from or how he came to be an officer in the Barnsley Pals. His medal card on Ancestry tells me that his full name was Thomas Heald Guest and some searching in the old newspapers on Find My Past gave me a good lead. 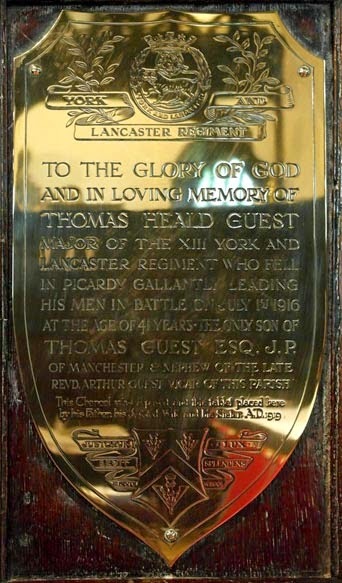 His father, another Thomas Guest, had paid for work to be done to St Oswald's church at Lower Peover (a place I had never heard of before - it is in Cheshire near Knutsford) and for a brass plaque to be placed there in memory of his son (Liverpool Daily Post 10 October 1918). Some Googling brought back an entry on the Military Images website with a photo of that very brass plaque and accompanying a transcription of the text was the information that Tom was also remembered on the Bloxham School Roll of Honour. The researcher there didn't appear to be having much more luck than me finding out about Tom, but he did mention that Tom was married to a Mabel Ellen Fountain and that they'd lived in Brighton, which suggested that a 1911 census record I'd thought might be Tom was probably correct. There had been a mention of a Mrs Guest in one of the Barnsley Chronicle reports, but I hadn't known if it was his wife or his mother. From that census return I now knew that he was born in Rusholme, on the outskirts of Manchester and that his wife was from Haigh, in Yorkshire. The marriage took place at Darton parish church on 3 October 1905. Tom's residence is given as Bowden, which is near Altrincham in Cheshire. Both Tom and his father are described as Manufacturers on the marriage certificate and Mabel's father Joseph Fountain (deceased) as a Colliery Owner - this all sounds very posh. Linking in with the plaque I'd already found the marriage was performed by Arthur Guest, Vicar of Lower Peover! But then Mabel and Tom go to live in Brighton, where I found them in 1911 ... so is the link with Barnsley just via his wife? The only birth entry for a Thomas Heald Guest tallies with Tom's age at death of 41 in 1916 and the district of Chorlton includes Rusholme - but of course sending for Tom's birth certificate would cost me £9.25 - drat you General Register Office! The sooner we have a system like Scotland's where the certificates are available cheaply online the better and I for one will be spending a lot more money. In Lancashire they are lucky enough to have a very good Online Parish Clerk website - these exist across the country, some are good, some are still in the process of collecting and transcribing their records. However searching for "Thomas Guest" on the site soon produced the next step on my journey back in Tom's family history. Thomas Guest senior had married Mary Jane Heald (so that's where Tom gets his middle name from!) in St James, Rusholme on 23 October 1872 and now I knew Tom's grandfathers' names - yet another Thomas Guest and George James Heald, a Solicitor. Next step, back to Barnsley looking for a Thomas Guest born in 1843 (ish) whose father is also a Thomas. This journey has strayed a long way from the Somme in 1916, but is getting closer and closer to discovering why Major Tom Guest is remembered with fondness on a memorial in a now lost church in Barnsley. This census snip from 1861 shows Thomas aged 19, a Grocer's Apprentice, living at 5 Market Hill, Barnsley with his father, Thomas Guest, a Grocer. Checking in Barnsley Streets Volume 3, I found that number 5 later became number 22 and several lovely pictures of Guest's Grocers shop before and after its redevelopment in the 1890s. So Tom's grandfather had been a well known Grocer in Barnsley - maybe Tom came to help out with the business in Barnsley (his grandfather, the elder Thomas shown above, died in 1867 and his uncle George in 1913) in the years between his sojourn in Brighton in 1911 and the start of the war in 1914. Maybe that was how he ended up in the Barnsley Pals. 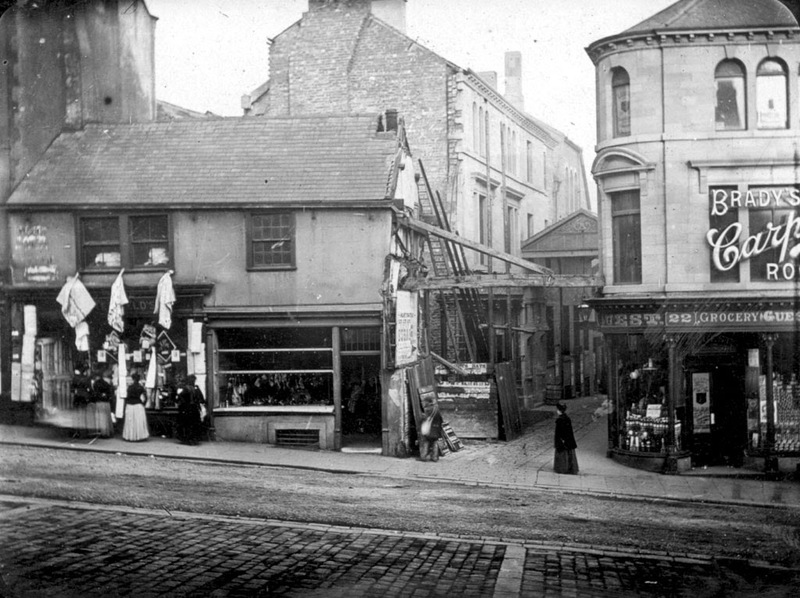 This is a picture of Guest's shop as the building next door was redeveloped and the top of the Arcade opened up to Market Hill, before that there had been a covered passageway into the yard behind. Guest's original shop was the large building just below the the covered passageway which is shown in this map from 1889 marked with a X to the right of the R of 'Market Hill' and then leading eastwards from that is a long narrow yard - shown as Guest's Yard - the family even had a street named after them! This is now the Arcade, a neat little covered shopping street leading down to Eldon Street. Major Tom Guest's story is far from finished, but writing it down like this today has focussed my thoughts and recorded the steps it took me to link this soldier with Barnsley. I have a lot more to write about the Guests and their intermarrying with other well known families in Barnsley like the Fountains and the Hewitts, but that will have to keep for another day.